Preheat plate on medium-high heat for 8 minutes. Prepare all the veggies and Haloumi. Brush the Tepanyaki plate with some of the olive oil, place the eggplant in the top middle area, place the zucchini below, place the spring onion down one side of the veggies, on the other side place the tomato halves. Brush the top of all the food that’s on the plate, the eggplant will absorb more oil than the other foods, so brush liberally. 5. Start turning the foods as they brown on the bottom side. As the foods are cooked remove and place into a bowl. As more room becomes available on the plate, continue to cook more veggies or the haloumi. Once all the food is cooked add in the rocket and basil, toss gently then add the red wine vinegar and toss again. Pile the food in a stack like look. Enjoy! Not only do we love cooking at L & M Goldstar but we love our wine too!. Did you know the best temperature to keep your wine long term is between 10 and 12 degrees C? 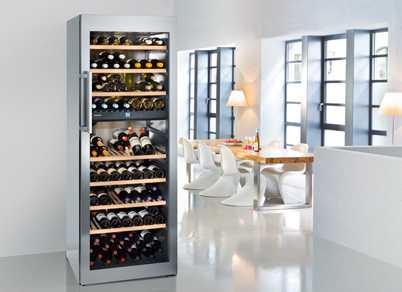 We keep a range of wine fridges in stock in our showroom. We would love you to come and meet with us at the Gold Coast Food and Wine Expo at the Gold Coast Convention Centre Jan 30 – Feb 1. We will be manning the Smeg display stand and the Smeg cooking appliances will be used on stage by all the guest celebrity chefs. More importantly we will have some fantastic specials on the day. In a saucepan, gently warm butter and chocolate until melted (not hot), set aside. Add melted chocolate mixture and stir well. Add sifted flour and macadamia nuts, stir until combined. Pour mixture into prepared tin and spread out evenly. Bake 30 minutes or until cooked when tested. Cool in tin. 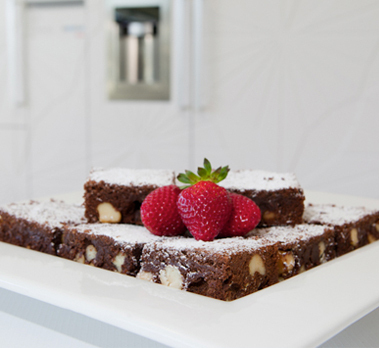 Cut into small squares and dust with icing sugar. Another cooking demo by Smeg and another geat idea. Instead of cutting out individual scones, why not just form into a round bun shape and slice the top and voila a fantastic pull apart scone – bun. This recipe was given to us by the V-Zug demonstrator from the Combi Steam recipe book- so it should be cooked in a steam oven. Mix the uncooked rice with vege stock and double cream, stir in diced capsicum, 2/3 of parmesan and herbs and season with pepper to taste. You might have to cut some of the base of the capsicum to keep it upright. Fill the capsicum with rice mixture, sprinkle remaining cheese on top. Hint: if you don’t have a steam oven then you will need to precook the rice then mix with a small amount of cream. Our new website is finally live http://www.LMGoldstar.com.au check it out. So, wanted something to snack on and of course nothing in the pantry – so had a packet of mountain bread – chopped in up roughly sprayed with oil and then sprinkled with garlic salt. In the oven at about 180 for 10-15 mins – moving around now and again and there you have it – healthy chips that are so yum. Set your fan forced or fan assisted oven to 180 degrees C. Line muffin tray with paper patty cases. In a medium bowl combine flour, mixed herbs and ground paprika. Add ¾ of cheese, the corn and zucchini. In a separate bowl, combine the buttermilk, egg and oil. Make a well in the centre of the flour bowl and pour in the buttermilk mixture, whisk to a batter.